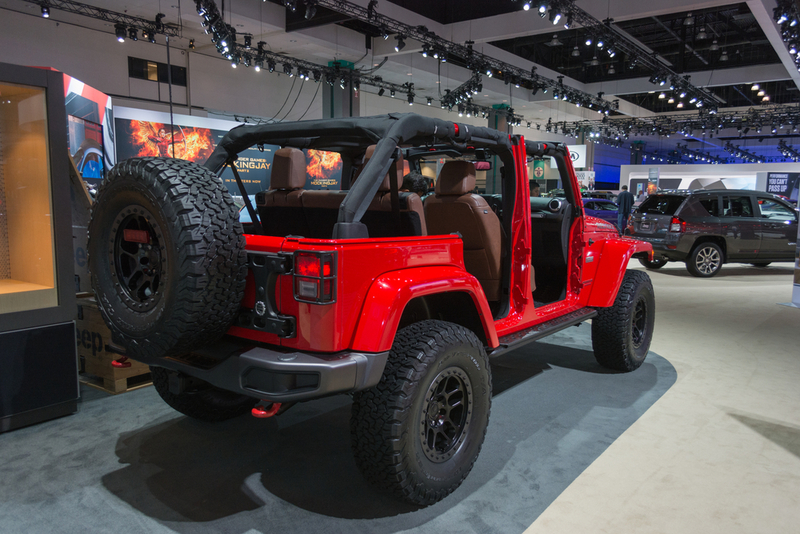 At SEMA 2015 (Specialty Equipment Market Association), Jeep got the chance to shine. As Jeep commemorates the 50th anniversary of the Easter Jeep Safari, they have released a very special edition of their iconic Wrangler: the Red Rock concept. 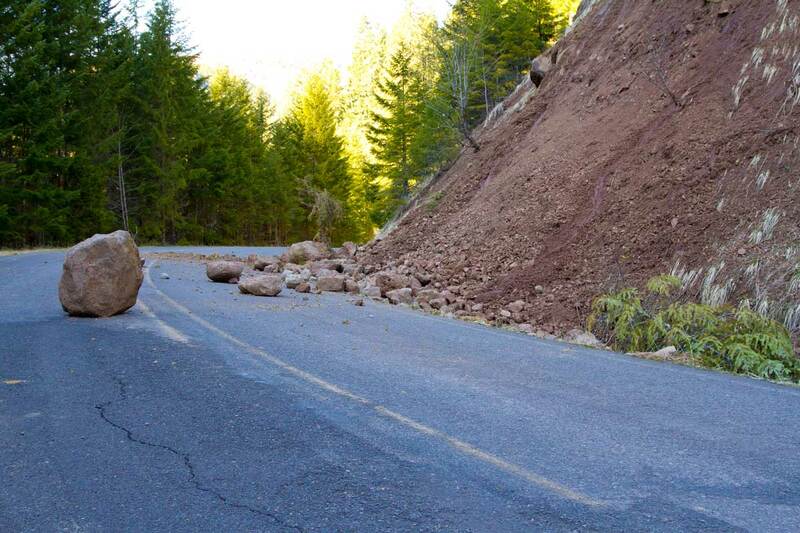 No the title “Red Rock” is not a reference to legendary rock star Sammy Hagar. Instead, Jeep is keen on homage to the history of the brand. That’s right, their latest concept vehicle is in fact named after the Red Rock 4-Wheelers club, the hosts of the annual Easter Jeep Safari in Moab. This car is based on the top-spec Wrangler Rubicon Hard Rock. The Red Rock is notable for featuring a manual transmission, next-generation Dana 44 live axles front and rear, 4.10:1 gears, a “Rock-Trac” transfer case, red tow hooks front and rear, rock rails, and a vented power-dome hood. On the outside you can notice the distinct hood decals, and there’s a uniquely low-gloss Granite Crystal bumpers with similarly toned black grille inserts. Even the headlight accents add some pop, visually speaking, to the proceedings, while the gears and transfer case work in tandem to give the Red Rock a 73.1:1 crawl ratio. How will it handle the road and off road? It comes standard with 35-inch BFGoodrich K02 All-Terrain T/A tires held on by 17-inch bead-lock wheels. The car has been modified with a two-inch lift kit in order to enhance potential clearance. The LED headlights and fog lights illuminate nighttime trail runs for on & off road adventurers who aren’t a big fan of sunshine. Recalling Jeep’s history, it will even come with a Jeep-branded CB radio allows you to live out your frontiersman fantasies either on- or off-road. And for those special drivers who might be put into a position to yank themselves or others out of trouble, the Red Rock’s got a Warn Rubicon-brand winch bolted to the front. Jeep’s “red Rock” really emphasizes the term “special” in “special editions.” It also means “limited.” In fact there will only be 50 units scheduled for series production. This extremely limited production run (for Jeep, anyway) was, as per its namesake, to commemorate 50 years of the Moab Easter Jeep Safari. That is in fact one of if not THE most anticipated and iconic events in the off-reading world. 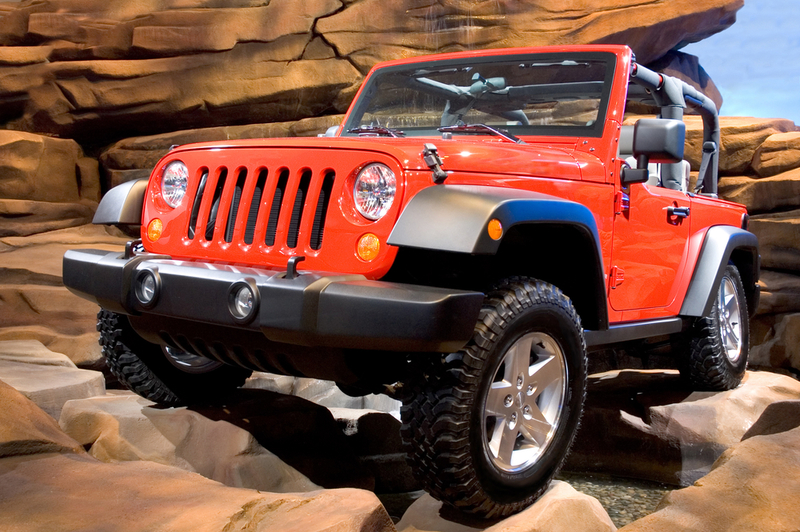 The Red Rock Jeep, which comes unique livery and trims, is more notable for the hardware beneath being essentially the same as the Wrangler Rubicon. What makes the edition/model more unique beyond the aforementioned are the fact that it still comes with even more hardware items features offered as Mopar dealer-sold or installed accessories all to help customize it for drivers. This car has the commemorative Red Rock badge and hood decal and body kit to stand apart from other Jeeps and all the other engine goodies, wheels and such. However the interior may be quite the attraction as well for the car. It has Amaretto Brown seats which are upholstered in—oh yes—Katzkin leather, with a distinguished silver accent stitching and embroidered Red Rock logos. There’s even a serialized plaque to further show the driver how privileged they are to be behind the wheel of this Jeep. 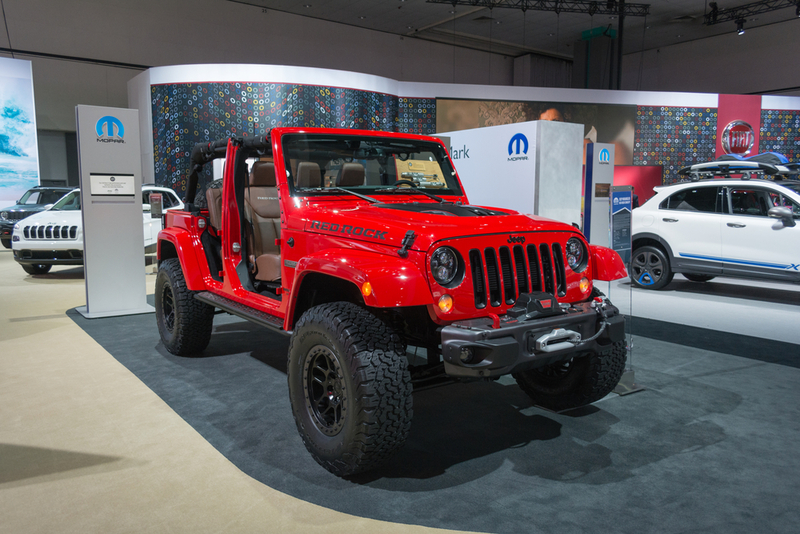 Of course, Jeep notes that these Wranglers won’t feature all of the equipment slapped on one presented at SEMA, but they do promise that some of the pieces used on the concept will indeed be available from Mopar. If you’re a fan of the Jeep brand and you can’t say no to a true special-edition Jeep, we suggest submitting your order faster than it took you to read this!